Tip: Call *3001#12345#* from any iPhone to enter Field Test Mode. Then tap Serving Cell Info. Your LAC will appear next to Tracking Area Code and CID will appear next to Cell Identity. Closest Sites still presents you with one-click access to the closest cellular and wireless broadband sites, with distance, bearing and topography. What's changed is how you tell it where to search. 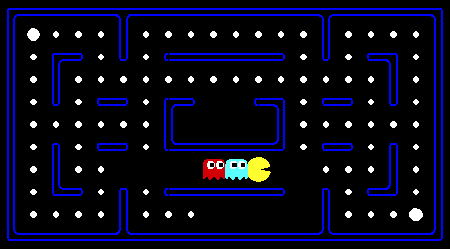 Previously, a search used the location of the crosshairs, fixed at the center of the map. Customers asked if there was a way to move the map, while at the same time preserving the location where Closest Sites would perform its next search. As a result, we replaced the crosshairs with a movable, circular bullseye, which Closest Sites now uses to perform its search. The bullseye stays where you move it: no matter where you move the map, the bullseye preserves your location. This means the bullseye can slide out of view. To find a lost bullseye, simply click the new Bullseye button. These changes are the result of feedback from customers like you! We're interested to hear from you about these, or any other changes you would like to see made to the Canada Cellular Services. Early last year, we produced a graph of per capita cellular site counts for Canada's 30 largest cities. The graph below provides a similar "coast to coast" analysis, but instead looks at cellular spectrum capacity by band: 700, 850, 1900, 2100 and 2500MHz. Overall, the largest bandwidth capacity lies in the 1900MHz and 2100MHz bands. Relative to other cities, Kitchener and Toronto have the greatest capacity in the 2500MHz band. The photos below chronicle the construction of Bell site W4925, a 12 panel stealth monopole in Mississauga, Ontario, at the intersection of Ridgeway Dr & Dundas St W.
The benefits of shrouding become clear, after you compare the photo in the middle with the photo to its right. The shrouding hides the industrial ugliness of the 12 naked antenna panels, presenting the public with something vaguely ambiguous, like a flag pole — minus its flag. What's not to like? Last month's Closest Sites redesign added a 2-D Fresnel zone to the green topographic graph. Our subscribers found this very helpful, but then asked: "Could we also view it in 3-D?" You can now. We've added an Export 3-D Fresnel Zone button, centered above the topographic graph. Click it to download a file containing the same Fresnel zone, but in 3-D.
Today, we welcome CCI Wireless as the 11th wireless broadband licensee to the Canada Cellular Services. Founded by Natural Gas Co-ops from across Alberta, and headquartered in Calgary, CCI offers Internet service to many rural areas across Alberta. They currently rank #3 in site count among wireless broadband licensees, with 149 sites, vs 195 for Inukshuk and 722 for Xplornet. A quick & easy way to identify signal interference. Wireless installers & troubleshooters value the simplicity & power of the Closest Sites feature of Canada Cellular Services. One click, and you're shown signal interference between your location and nearby cellular & wireless broadband sites. 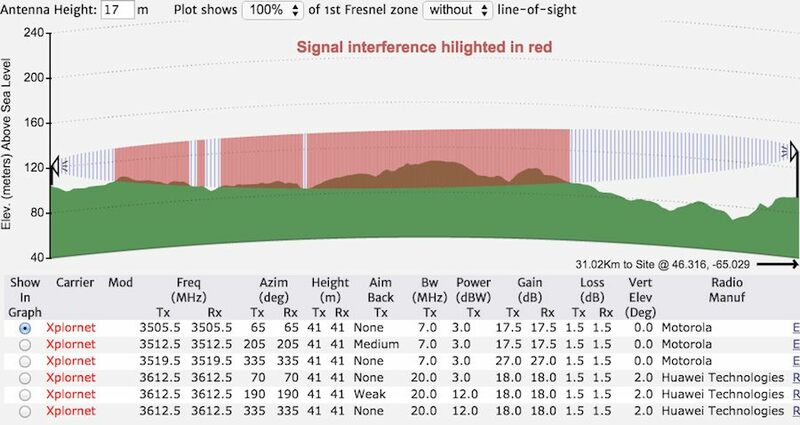 We recently spoke with a subscriber who uses a 3rd party tool to plot the Fresnel zone against land formations to identify interference. six Show In Graph buttons (bottom-left) select the carrier antenna. In short, one click of the Closest Sites button can model potential interference between your antenna and any of the 250,000+ cellular & fixed wireless antennas across Canada. This model also considers the earth's curvature, which is important for distances beyond 5km. Although the tree at the left lies below the line-of-site, it overlaps the oval-shaped Fresnel (fra-NELL) zone, and for this reason, can interfere with communications between the antennas. As well, for distances greater than a few kilometers, the earth's curvature can elevate flat, obstruction-free land into the Fresnel zone, further increasing interference. Most Canadians access digital TV via their cable or satellite provider — and for this, they pay a monthly fee. About 10% of us, however, access digital TV over-the-air (OTA) — and pay nothing. OTA was originally allocated 480MHz of spectrum, divided into 81 analog NTSC channels. Between 2009 - 2011, OTA transitioned from NTSC to higher-quality ATSC (digital), supporting 1080i and 720p HDTV. Although OTA is available to 97% of Canadians, only 10% currently use it. This low penetration has consequences. Reallocate these channels to mobile broadband. As the tide goes out for OTA users, beachfront property is created for mobile broadband providers. One organization, PIAC, opposes reallocating the 600MHz band, which you can read more about here. Although largely abandoned by smartphone subscribers, 2G remains an important service for Machine-to-Machine (M2M) communications. Rogers remains the only Canadian carrier to offer 2G service. We've been tracking changes to their 2G network capacity, as shown by the graph to the right. 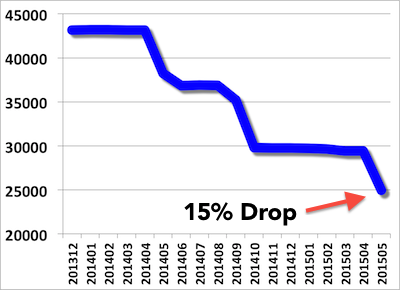 This drop represents 15% of their 2G antennas and 14% of their 2G sites. We believe this move by Rogers will allow them to redeploy this spectrum and offer even better LTE service to its cellular subscribers. Most carriers assign each site a unique site or tower code. 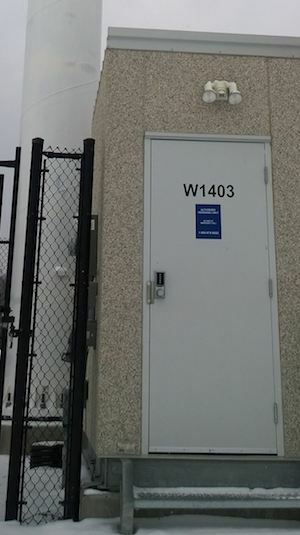 These site codes are usually printed on the equipment or shed at the base of the site, as shown by the photo of Bell site W1403 (at right). The Canada Cellular Services search box, located in its upper-left corner (see below), now lets you search for a site by its site code. Site codes are unique across an individual carrier's sites, but not across all carriers' sites. For example, Rogers and Bell both use W1891 to identify their sites; however Rogers site W1891 is in Winnipeg, and Bell site W1891 is in Sault Ste. Marie. Canada Cellular Services currently supports over 13,000 sites from Rogers, Telus, Bell, Wind and Eastlink. We will expand support to other carriers, as data becomes available. Eastlink deployed its MBS service at new sites only. Rogers recently deployed 7,579 antennas, and a net site count increase of 27. This includes 6,579 MBS 700Mhz antennas. With this addition, Canada Cellular Site now hosts 2,629 MBS 700Mhz sites, more than double what it hosted a few months ago. 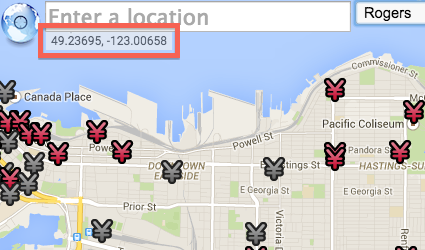 This deployment also shows that Rogers is reusing existing sites, instead of deploying (costly) new sites. Every day, we receive information about updates the carriers have made to their cellular and broadband sites. These updates are applied to the Canada Cellular Services. Yesterday, Telus reported 14,663 new antennas, and a net site count increase of 145. 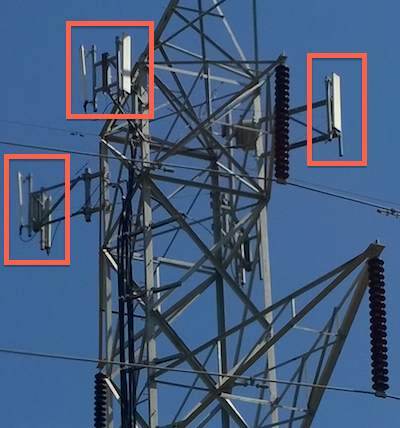 The bulk of these antennas were deployed at existing sites, and illustrates a mistake analysts sometimes make when measuring the growth of cellular capacity across Canada. Most of these new antennas were deployed in Western Canada; as well, Telus abandoned over 200 sites in Eastern Canada. 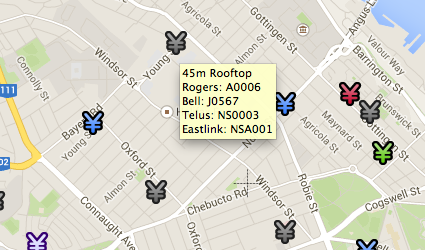 Telus site ON0458 is one of these abandoned sites. Its six antennas resided 40 meters above ground, on an electrical transmission tower in Burlington Ontario, on the east site of Walkers Line just south of Dundas St. Photos of this tower and the remnants of this site are to the right and below, respectively. The photo of the transmission tower (at right) clearly shows antennas and cabling extending down its left side. It looks as if the site is still there! But, look a little closer and follow the cables. 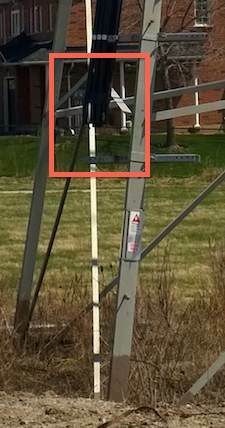 The middle photo below shows the cables terminate about five feet above ground level. 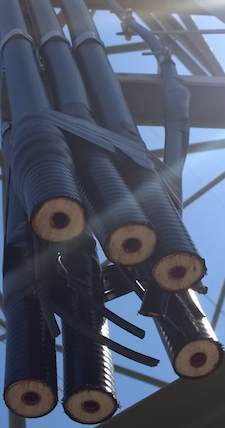 The photo to its right shows a cross-section of these six cables, one for each antenna. Other abandoned sites we visited were stripped of everything: cabling, brackets, antennas, shelter, radios, etc. Perhaps the salvage value of what was left behind at Telus site ON0458 was worth less than the cost of their retrieval. Reports of site expansions, colocations and new / decommissioned sites quickly make their way to the Canada Cellular Services. 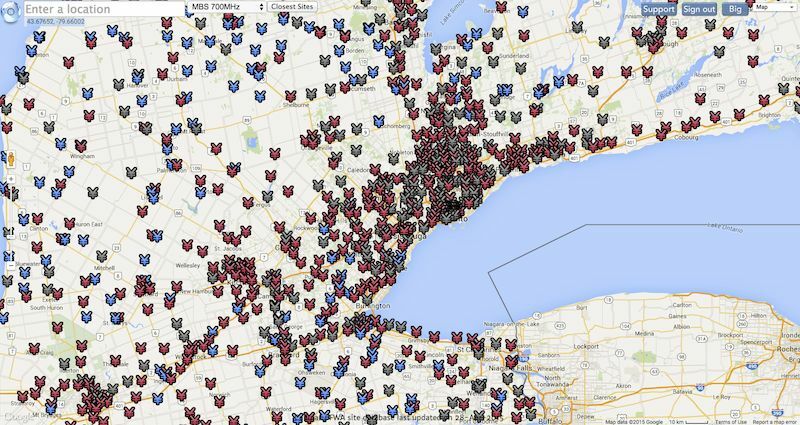 Did you notice the coverage gaps around Toronto and Montreal? Xplornet, like other wireless broadband licensees, serves primarily rural areas, leaving Rogers, Bell and other cable, DSL or FTTx providers to take care of subscriber-dense urban areas. Lat / Lon Indicator: shows coordinates of the center crosshairs. Enhanced Tool-tip: hover over a cell site marker to see structure height & type (where available) and list of carriers and site codes. Currently, only a few hundred sites have a structure type; this number will increase as we continue with our site survey. Friday, 16-Jan-2015 — Eastlink's Westward Expansion? Every day, we monitor the growth and movement of carriers' cellular deployments Canada-wide. The red squares hilight Eastlink's four new 700MHz cellular sites in Timmins, Sudbury, Saint John and Moncton.